A mini excavator is a tracked or wheeled vehicle smaller than its heavier cousin the excavator. Used in a wide range of lesser projects, the mini excavator is commonly used for: Grading, Trenching, Backfilling, Digging, Demolition and Small-scale excavation. Mini excavators are either conventional tail swing or in zero-tail swing. Conventional tail swing options have a rear counterweight that spreads over the tracks when the cab rotates. The zero-tail swing class are intended for spaces that are limited. Because the house remains within the width of the tracks, they allow operators to focus on the job at hand instead of worrying about where they are swinging the boom. Mini excavators have an operating weight of 0.7 to 8.5 tons. The mini excavator is made of several parts that make it an extremely useful machine in construction and demolition. The house consists of the cab, engine, and other operating components. The house can rotate without limit on the undercarriage making it versatile wherever it is working. The undercarriage includes the tracks, rollers, and other components associated with the movement part of the vehicle. It provides support for the equipment as it works. 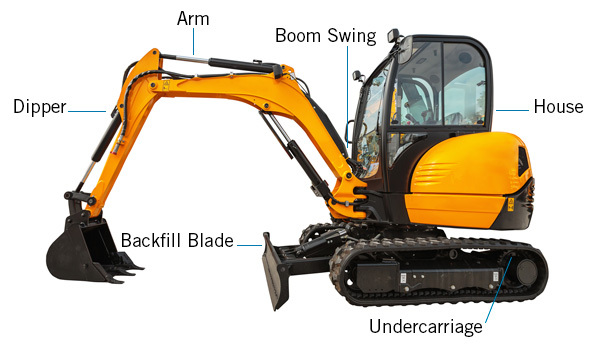 The dipper, arm, and attachment, commonly referred to as the “workgroup,” are connected to the front of the mini excavator. Attachments can include an auger, breaker, and bucket. The boom swing is one of the primary advantages to a mini-excavator as it allows the machine to do offset digging around obstacles, foundations, and walls. TThe backfill blade is instrumental in offering a higher level of functionality for the mini excavator. It is used for backfilling, trenching, leveling, general dozer work, and grading. Determine whether your primary jobs will be light jobs or more heavy duty then compare the horse power on the machines. Mini excavators range between 10 hp and 50 hp. Mini excavators use diesel fuel and are subject to Tier 4 certification requirements. It is important to check the tank size and emissions quality of the machine before purchasing. 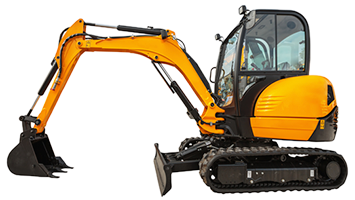 The range of digging depth on mini excavators is 5.6 to 12 feet deep. Consider how far into the ground you need to dig while browsing these machines. Unlike the excavator, mini excavators come in smaller weights of 2,000 to 18,500 lbs. The weight of the machine is a crucial fit for the type of project you are pursuing. There are several popular manufacturers in the backhoe market including Bobcat, John Deere, Caterpillar, Kubota, Komatsu, and Terex.